Roberto Ampuero's novels starring the wonderfully roguish Cayetano Brule are an international sensation. In The Neruda Case, listeners are introduced to Cayetano as he takes on his first case as a private eye. Set against the fraught political world of pre-Pinochet Chile, Castro's Cuba, and perilous behind-the-Wall East Berlin, this mystery spans countries, cultures, and political ideas, and features one of literature's most beloved figures-Pablo Neruda.Cayetano meets the poet at a party in Chile in the 1970s. The dying Neruda recruits Cayetano to help him solve the last great mystery of his life. 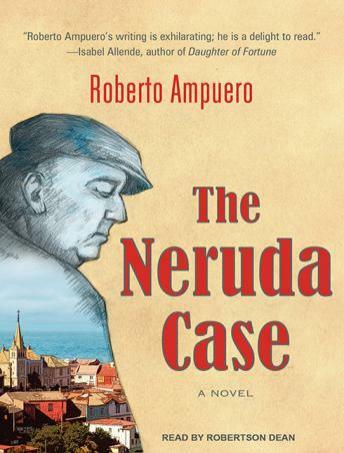 As Cayetano fumbles around his first case, finding it hard to embrace the new inspector identity foisted upon him, he begins to learn more about Neruda's hidden agenda. Neruda sends him on a whirlwind expedition around the world, ending back in Chile, where Pinochet's coup plays out against the final revelations of their journey.Evocative, romantic, and full of intrigue, Ampuero's novel is both a glimpse into the life of Pablo Neruda as death approaches and a political thriller that unfolds during the fiercely convulsive end of an era.